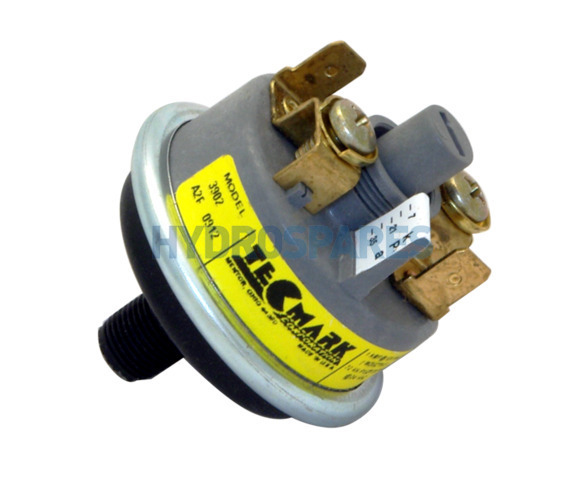 This pressure switch is manufactured by Tecmark and labled with part numbers 3902 (with screws for ring terminal electrical connections) or 3903 (without screws). This switch may also be found on Hydroquip equipment with a part number 34-0178. In either case this is the same switch unit only lableled differently. These switches convert a pressure signal to an electrical output in response to a change in pressure and movement of an elastomeric diaphragm which opens and closes an electrical circuit based on a set pressure. Electrical connection is via the 2 x 6mm spades or 2 x screws for ring terminals. The switch is connected to the heater with a 1/8" MPT (Male BSP) thread. The unit is extremely easy to replace, but it is advisable to drain the spa to prevent water damage through spraying of water onto the circuit board as this switch may be found inside the control box.